Portugal has a rich and unique culture, the lively cities of Lisbon and Porto, and a beautiful countryside. The variety of landscapes is incredible: green mountains and spectacular gorges in the North characterized by small farms and vineyards; the central coastal region consists of dunes, pine forests and rolling hills; the Alentejo region has plains or desert-like terrains; and the South has highly developed stretches of beach. No wonder Portugal is among the 20 most visited countries in the world. 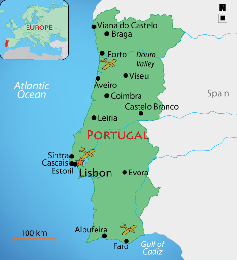 The most popular tourist destinations in Portugal are Lisbon, the Algarve region and Madeira, but the Portuguese government is currently developing new destinations such as the Douro Valley, Alentejo, Costa do Sol, Costa Azul, Braga, Coimbra, Evora, Minho and many more.